With the ongoing plans to close Earls Court Exhibition Centre, Hyper Japan have had to shop around for venues, with the result that they’ve actually returned to Olympia (where they staged their second event back in 2011). As usual, Hyper Japan provided a variety of stalls, events and happenings all designed to promote Japanese culture. Sake, always a regular part of Hyper Japan, appeared to enjoy a much higher profile this time around. Certainly the many tables offering up sake samples appeared to be very popular (it would have been rude to refuse…). For the music element of the November event, Hyper Japan went for a few leftfield choices, including Diana Garnet, Joe Inoue and Kioke Miyu. Kioke, in particular, gave an “interesting” stage performance. But more on these performances later. The secondary stage was home once again to a variety of talents from the UK performer scene, which this time included Kelsey Ellison, Himezawa, Scarlett Young, KleptoPenguin, MK Dance Group and J Britton. The quality of these acts appears to have taken a leap forward in recent years – with the added bonus of the community spirit providing an opportunity for some interesting collaborations. Friday’s stage stars included Himezawa, who has carved out her own particular niche in the UK scene since moving over from her native Germany. Her rapid rise led her to take part at the recent Moshi Moshi Nippon Festival in Japan, sharing the stage with the likes of Kyary Pamyu Pamyu. For her Hyper Japan appearance she opted for some solid choices of tunes culled from THE iDOLM@STER and Hatsune Miku’s ‘Galaxias’. With an energetic performance and inspired choreography, Himezawa also got into the Christmas spirit by flinging Christmas crackers into the audience. The vocal talents of J Britton were also on hand. This former Nodojiman THE WORLD contestant surprised audiences with a particular warmth and intensity delivered care of cover versions of SEKAI NO OWARI’s percussive ‘RPG’ and the plaintive tones of ‘KISEKI’ by Greeeen. One of the additional attractions of this November’s Hyper Japan was the presence of Hatsune Miku, albeit via Japanese fan group DPH who are responsible for creating their own animation and choreography of Miku for an event that they take around the world titled Mirai no Neiro (‘The Sound Of The Future’). While Vocaloid technology offers up an intriguing method of creating music, replicating it in a live setting is a much tougher gig to pull off. The DPH team had a number of issues to contend with, including a room too small for the purpose plus, crucially, no live band element (problems that fellow Vocaloid fan outfit Miku UK team solved for their 2013 performances). There’s probably a better angle for the Mirai no Neiro team to take in the future – offering up more of a presentation perhaps rather than marketing it as a performance. As an attempt to get audiences familiar with Hatsune Miku and Vocaloids however, it has to be applauded. Meanwhile, back at the sub stage, Kelsey Ellison unveiled her Christmas-themed performance. Always keen to make her performances as much of an event as possible, Kelsey’s setlist included an energetic rendition of her own song ‘Pom Pom’. the Youkai Watch theme as well as an inspired jazz-style cover of ‘Sorairo Days’ from Gurren Lagann. One of the bonus elements of Kelsey’s performance was the guest appearance of Andy Lee; aka KleptoPenguin who was invited to the stage while Kelsey took a break to get her breath back. Delivering a dramatic rendition of Sailor Moon’s ‘Moonlight Densetsu’ (helped by focusing his performance on some handy Sailor Moon cosplayers in the audience), Andy provided a perfect break before Kelsey came back on stage. To the strains of Hyadain’s ‘Christmas? Nani Sore? Oishii no?’, the pair put on an entertaining performance. A straight rendition would have been perfectly acceptable, but the added elements of Andy attempting to please a reluctant Kelsey with Christmas presents introduced a witty comedy element into the mix. 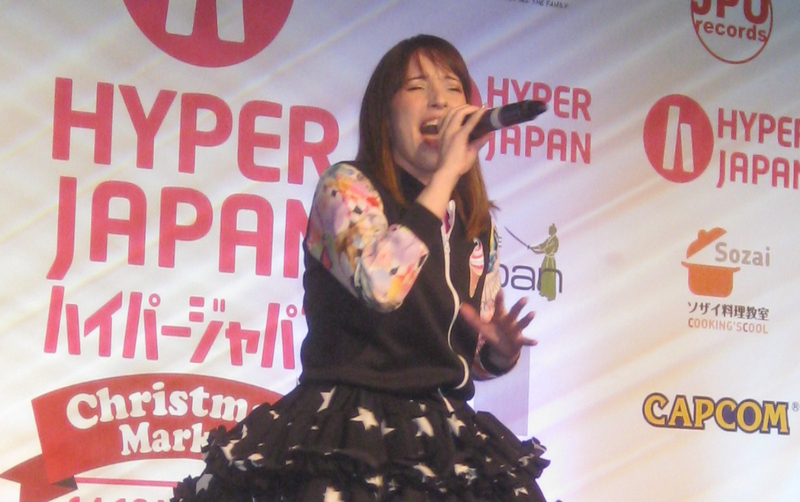 We’ve mentioned the amazing talents of Scarlett Young in the pages of J-Pop Go previously and her appearance at Hyper Japan was, once again, a fitting showcase for her vocal skills. She delivered a compelling version of what’s become one of her signature tunes, ‘Lion’ (from Macross Frontier) as well as an inspired choice of ‘Zankoku na Tenshi no These’ (from Neon Genesis Evangelion). Another highlight was Scarlett’s take on the perky ‘Lum’s Love Song’ from Urusei Yatsura. Saturday offered up an opportunity to see some of the other entertainments that Hyper Japan had on offer. This included the Hyper J-Style Collection Fashion Parade (which Kelsey Ellison managed to land first place for) and also included a performance slot from the wonderful Anna Yano, returning to Hyper Japan after her UK debut in the summer. One of the exclusive performances of the afternoon however was reserved for Diana Garnet, marking her first international performance. This US-born singer (now resident in Japan) stormed the spring 2013 Nodojiman THE WORLD TV show with her rendition of Judy & Mary’s ‘Sobakasu‘ – a culmination of her impressive CV built up over appearances at US conventions, including contributions to the Disko Warpo label. Opening with her winning Judy & Mary cover, Diana demonstrated precisely why she’s held in such high esteem via her powerful vocals which delivered an assortment of tunes, including selections from anime titles Full Metal Alchemist, Neon Genesis Evangelion and Bleach – the latter being a particularly meaty cover version of SCANDAL’s ‘Shōjo S’. The final day of Hyper Japan on Sunday offered up some travel challenges with many train services out of action. Those that managed to finally arrive mid-morning were entertained by the return of MK Dance Group (now trading under the much simpler banner of “MK”) on the sub stage. At some point MK have stepped up a gear as their previous appearances at events (such as the MC Expo) were fine, serviceable dance performances, but lacked perhaps an element of flair. Now they came decked out in elaborate matching outfits, sharp choreography and a good sense of formation changes (For instance, Rachel and Kelsey’s breathless performance routine to Babymetal’s ‘Gimme Choco’). But their centrepiece is an ensemble performance to ‘Santa San’, which features an energetic choreographed routine enhanced by an inspired cameo by Andy “KleptoPenguin” Lee. Meanwhile, a new dance outfit were making their Hyper Japan debut. Normally a 5-piece group, The Wish Sisters were slimmed down to a trio for their sub stage debut. Alice Amelia and Elizabeth displayed a confident stage presence and some smart choreography for a number of tunes, including ‘START:DASH! !’ from Love Live!. They also encouraged the audience to join in with a wotagei demonstration. Back on the main stage, another debut was taking place in the shape of Koike Miyu. We’re not sure what words best describe Koike’s performance, although ‘Bonkers’ is probably quite an apt one. This idol star, who made her major label debut last summer on the Victor Entertainment label, also appears on Japanese TV and radio shows and is described as having a dojikko (cute but clumsy) personality. Sunday also saw the return of Cinnamon Purin to the stage. The dance group fronted by Finny Attridge (of Marshmallow Llama Time fame) presented a variety of dance routines to some choice J-Pop tunes, including ‘Doki Doki Morning’, ‘Viva Happy’ and ‘Discoteque’ (from Rosario + Vampire). The most inspired performance of the day however had to be the supergroup formed of Himezawa, Kelsey Ellison, Scarlett Young, Andy Lee and J Britton. The KP All Stars presented a boisterous performance of the Pokemon theme tune that definitely struck a chord with the audience. Closing out proceedings on the main stage was a performance by Joe Inoue who delivered an energetic rendition of ‘Closer’, his contribution to anime classic Naruto. Joined on stage by Diana Garnet, the pair also served up another Naruto tune with a cover version of Flow’s ‘GO!!!’. What we brought away from Hyper Japan’s Christmas event was the sense that the UK performer scene is undergoing a transition. It’s evolving and that evolution is also being bolstered by the sense of community and support that all the performers share. The future of that scene appeared to be on show on the sub stage at Hyper Japan and we look forward to seeing what these performers deliver in 2015. Hyper Japan will return in summer 2015 (date TBC) and also the Hyper Japan Christmas Market 27th-29th November 2015 at London Tobacco Dock. J-Pop Go would like to extend its warmest thanks to the Hyper Japan team.